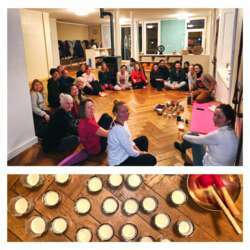 Protected content of Protected content has been successfully running the Candlelight Yoga class every Sundays at 4.30 pm to 6.00pm Ish...! Postures can be adapted by each person; beginners or experienced. The focus is on strengthening the body as well the mind. And there are breathing exercises (Pranayama) to strengthen the respiratory system and release the stress of the day to day life and improve the flow of energy. At the end of the class, we will experience - Yoga Nidra meditative relaxation practice which refreshes your body, mind and the spirit. We focus on different subjects each week- Eg: Anxiety, Insomnia, Stress, Gratitude, Chakra meditation etc. . .. more. Protected content Ayurveda- Hypnosis background reflects in his Yoga - and meditation practice.